Toothpaste Ingredients - What's in that Drug Store Brand? Which toothpaste ingredients need cause us concern? Most commercial toothpastes are a combination of chalk, soap (SLS), glycerin and flavorings with a variety of additives. Many ingredients are there for cosmetic and usage reasons which don't always have to do with cleaning efficiency and health. Here are some of the commoner toothpaste ingredients found in drug store and supermarket brands. Most toothpastes contain Sodium Laureth Sulphate (same thing as Sodium Lauryl Ether Sulfate, or SLS) which creates foam and does play some role in cleaning. It's a major ingredient in washing up liquid. It isn't strictly needed, though, in toothpastes and some studies have tended to show that it makes human tissues (skin, scalp, mouth surfaces) more easily penetrated by other chemicals. Many alternative toothpastes do not use it. Ammonium lauryl ether sulfate is now often used in preference to SLS because its larger molecules don't penetrate our skin and mouth membranes so easily. Detergents are anti-bacterial and have a role in breaking up plaque. A variety of abrasives are found in commercial toothpastes (see individual chemicals below). Silica is a natural component of sand which is extremely hard and it helps the cleaning process by being abrasive. It has been used in toothpastes for a long time. It is generally considered safe in some forms. Hydrated silica is the particular type of silica used in gel toothpastes. It is a bio-accumulator i.e. it can persist and build up in wildlife and humans. Calcium (chalk) Many toothpastes include calcium salts as abrasives. It is considered safe. Tetrasodium pyrophosphate (TSPP) is sometimes used as a water softening agent which removes calcium and magnesium from the saliva so that less plaque is formed. It is unpleasant tasting and alkaline and needs other ingredients (detergents) present to make it work. It is rated as moderately toxic by Toxnet. Some toothpastes may contain Triclosan which helps kill plaque-forming microbes. Triclosan is one of those bio-persistent chemicals which turn up in fish, breast milk and wastewater. Tooth whitening pastes may contain hydrogen peroxide. There are some health queries about the safety of this, especially in more concentrated amounts found in some products. One study (by Europa) concluded that most people suffered no problems from a 1.5% hydrogen peroxide solution used twice a day. However, hydrogen peroxide is also classed as a weak carcinogen and they also concluded that it should be sold in a 0.1% concentration only. Stronger solutions would need to be obtained by prescription. Some tooth-whitening products may contain sodium hydroxide (caustic soda). It is considered a moderate hazard. Most over-the-counter tooth whitening pastes include carbamide peroxide, which is generally produced from perhydrol urea, an animal product rated as moderately toxic by EWG. It is banned in Canada. Sodium carbonate peroxide is added to some whitening toothpastes. It breaks down into sodium carbonate (washing soda) and hydrogen peroxide. The hydrogen peroxide then bleaches the teeth and kills germs around the gums. Titanium dioxide (also found in sunscreens) is used to make the toothpaste opaque and bright white. It is found in Aquafresh, among others. Low hazard. Polyethylenes such as polyethylene glycol (PEG) and other polymers are found in many toothpastes where they are used to bind and stabilise. Health concerns include cancer, allergies/immunotoxicity and organ system toxicity. Fluorides are used to harden the teeth against decay. They work best when combined with surfactants (detergents) such as SLS and ALS. There are many health queries over the use of fluoride. Sodium fluoride is commonly used and is thought to be a cancer-causing agent (carcinogenic) in prolonged use. Sodium monofluorophosphate has similar properties. Colours such as Yellow 10 Aluminium Lake also carry similar health concerns. Many ingredients are fairly irritating. Allantoin (thought to be harmless) is sometimes added to counter the irritation caused by detergents, alkalies, and acids. Flavourings are used to mask the unpleasant taste of some of the ingredients such as the detergents and phophates. In addition, sweeteners such as sodium saccharin are added to improve the taste. Other flavours are usually based on mint essential oils. Fragrances can cover a multitude of things, from innocuous natural ingredients such as aniseed or mint to quite potent chemicals which persist in the environment. So which ingredients of those above are found in the better, healthier brands? Unfortunately, even traditional "safe" toothpaste ingredients are considered some risk by authorities such as EWG (the Environmental Working Group). For example even baking soda (sodium bicarbonate) has some health concerns attached to its use in large amounts. The fact is that many chemicals and ingredients are just not yet sufficiently well researched and understood. However, the EWG helps us to take balanced view. They now have the largest public, product-safety database anywhere in the world, giving safety info on 25,000 products and thousands of ingredients. I've checked all the toothpastes recommended on the how to make toothpaste page. They all check out well for suspect ingredients, that is, they don't really contain any. As mentioned above, even baking soda is not seen as completely hazard free. And some of the great brands reviewed do supply some toothpastes with fluoride simply because some customers want it. Of the products listed Burt's Bees, Desert Essence and Peelu Company toothpastes are some of the very safest available. Tom's of Maine scores well too. So do Nature's Gate and Jason products. 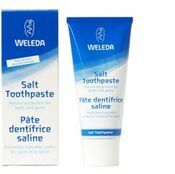 Weleda's children's tooth gel scores well but their salt toothpaste (one of my favourites) does not score so well mainly because of the presence of fragrances - though they (Weleda) list these as just natural essential oils of aniseed, eucalyptus, lavender, peppermint and sage. "Over 500 companies have voluntarily signed a pledge called the campaign's "Compact for Safe Cosmetics," a pledge to formulate products that do not use ingredients that are known or suspected to cause certain health harms within three years of signing." A good few also have policies which are against animal testing, or are working on eliminating animal testing from their procedures. If you want to check out particular products in detail go to Skindeep, the EWG site which gives detailed info on thousands of products. See Green Links for details.